Another holiday season is coming to an end. It’s time to put away the tree and box up the Christmas lights. The new year means that Valentine’s Day is only six short weeks away. Do you know what you’re getting that special person this year? If you’re thinking about getting your loved one a piece of jewellery, you’re not alone. According to Statistic Brain, 17.3 percent of all Valentine’s Day gifts are some type of jewellery piece. It’s estimated that Valentine’s Day generates nearly $2.2 billion in sales for jewellery stores throughout the US. It’s best to start your jewellery shopping now, it can be a big task and can lead to a lot of stress if left to the last minute. This is the perfect time to get started. Begin the process by paying attention and taking note of your partner’s individual style and taste. Sneak a peak in their jewellery box when they’re not looking and see what’s missing. Are they in the market for a new bracelet, ring, earrings, watch, or necklace? Get some help, don’t be afraid to seek input from their friends and family. Some people have simple tastes and will not want to wear something that’s too loud, or maybe they like something that’s a little flashier. Tastes will vary greatly from person-to-person. Starting your shopping early can open the door to some really exciting post-holiday or early Valentine’s Day sales. Purchasing a custom designed jewellery piece is another option that many of our Markham, Richmond Hill and Toronto customers enjoy. It can be a surprisingly affordable option and will make your gift from the heart truly unique. It’s also important to establish a budget for your Valentine’s Day jewellery purchase. Our team of Richmond Hill jewellery designers have helped create special Valentine’s Day memories since we first opened our doors over 60 years ago. We’ll walk you through the entire jewellery shopping process, explaining all the terminology, options, and prices along the way. We know you have a budget and we’ll help you stick to it, offering you excellent customer service and value for your money. Be wary of the financing options offered by some of the bigger box jewellery stores. At first glance, the rates typically seem attractive, but these are often promotional rates and will revert to a higher amount after a few months. In the long run, financing a jewellery gift can lead to you paying a lot more for your purchase when it’s all said and done. Be careful shopping for jewellery online. Shopping for jewellery in person gives you the ability to touch, feel and closely examine pieces before you purchase anything. Online pictures really don’t do that special gift justice. A deal that seems too good to be true probably is and you should be very cautious of any heavily discounted online item. Buying from a trusted jewellery store provides you with the peace-of-mind of knowing that you’re buying something made of high-quality materials and excellent craftsmanship. Valentine’s Day highlights what’s traditionally known as the ‘proposal season’ with an estimated 40 percent of engagements happening between the months of November and February. Thinking about popping the big question this year? Our team of experienced Richmond Hill jewellery designers will work with you to create a one-of-a-kind engagement ring that symbolizes your love story. There are also plenty of Valentine’s jewellery gifts for newer relationships. If you’re in a new relationship, consider buying your partner a bracelet or a necklace. Our Richmond Hill customers have shared some very romantic Valentine’s Day stories with us over the years. Presenting your gift in a romantic way can add a lot and make the experience much more memorable. Try sending your loved one on a treasure hunt, include tickets to a concert in the jewellery box, or use joke packaging. Shopping for Valentine’s Day jewellery doesn’t need to cause panic or drain your bank account. Start early and find a local jewellery store that has the options and experience to do the job right. Don’t stress out about finding the perfect gift, your loved one will look at their jewellery and always remember the thought and love you put into their gift. We’ve helped create Valentine’s Day memories for over 60 years. Our experienced Richmond Hill jewellery designers are waiting to walk you through the entire jewellery shopping process. We will help make this Valentine’s Day one to remember. The gift of gold, precious stones and diamonds has always served as a display of commitment. Jewellery gifting is a fabulous way to make a lasting impression on your loved ones. After all, tis the season of love. As you’re making your Christmas shopping list for that special person in your life there are so many options. Perhaps it’s a ring, a necklace or a pair of earrings, giving and receiving jewellery during the holidays has a timeless feel. Each piece of jewellery has a special meaning — It might be a reminder of a celebration, an engagement or promise for the future, maybe it becomes a symbol of the things you can’t simply put into words. In any case it’s a special and unique gift that will last forever. Odyssey Jewellery Designers Inc. offers a legacy of unparalleled craftsmanship, originality, and quality. With over 60 years experience in the jewellery industry, Odyssey has a full factory and all work is done right on the premises. Discover how we can bring your imaginations to life and help you create jewellery that reflects your own unique character. We are manufacturers and importers of platinum, 18kt gold and diamond Jewellery. Our commitment to you is always perfection and beauty in all our pieces. Here at Odyssey we will help you find that very perfect expression. Let yourself be captivated by all that glitters at Odyssey Jewellery. Affordable prices go hand in hand with the elegance and quality of unique handcrafted jewellery. A brilliant reminder of what forever looks like. We create anything you can dream up or choose from our beautifully handcrafted custom jewellery. Come check out our showroom today! Let our highly experienced and knowledgeable staff help you with your next important jewellery purchase. We will work with you to find exactly what you need and get what you love. Come see us today for all your custom jewellery needs. We’d love to hear from you. You will instantly see our passion for jewellery and years of experience as soon as you walk through the door. We look forward to seeing you. Your engagement ring serves as both a symbol of your relationship and as a beautiful announcement of your upcoming wedding. 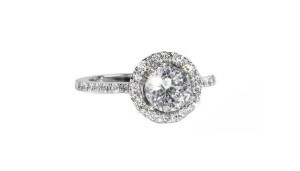 The ideal engagement ring will represent your personal style and taste. There are various engagement ring options available to Richmond Hill jewellery shoppers today. When shopping for an engagement ring, you will need to determine the type of stone you want to purchase. There are various options on the market that will suit most tastes and budgets. Many couples elect to go with a diamond engagement ring. Diamonds offer a high level of elegance, beauty, and harmony to your engagement ring. No two diamonds are alike and finding the right diamond for your engagement ring design is an extremely important part of the puzzle. Your custom engagement ring designer will show you various types of cuts. Round, princess, pear, cushion, marquise, heart cut, or emerald – there are plenty of cuts out there that will suit the needs of any ring or its owner. People who enjoy sparkle will tend to have a princess or round diamond cut because there are more light-reflecting facets on the stone. Other cuts such as oval, heart, and pair will give your engagement ring a more unique look. There’s no such thing as a bad diamond cut; diamond cuts are timeless and never go out of fashion. Finding the right cut of a diamond will greatly impact the overall look of your engagement ring and will play a critical role in determining the remaining design elements of your diamond ring. 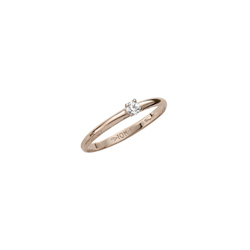 The karatage of your engagement ring will provide a further level of customization to the piece. 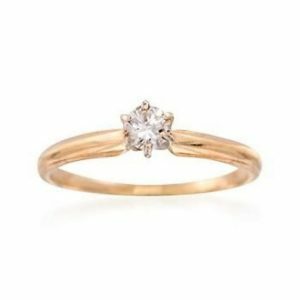 When shopping for a diamond ring you will encounter rings made of white gold, rose gold, and yellow gold, you’ll want to consider the karatage of the ring before making a purchase. Think about what type of gold looks best with your skin tone. The purest gold rings are 24kt, while 18kt gold contains 75% pure gold, 14kt gold contains 58.5%, and 10kt gold contains 41.6% pure gold. 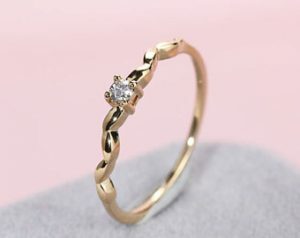 Every couple will have unique tastes and budgets, 10kt gold engagement rings tend to be a popular choice since they are affordable and durable against scratching. 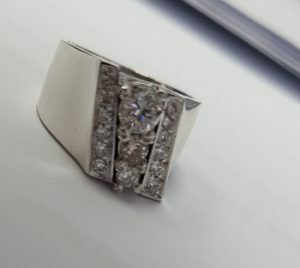 Remember, a ring’s karatage refers to a ring’s metals and should not be mistaken for diamond carat, which is used in reference to the weight of the diamond in the ring. 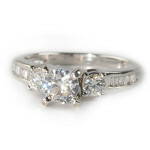 Platinum is another option for those not looking for a gold engagement ring and mixing metals is another popular trend. Karatage is not the only factor in determining the value of a diamond. You’ll also want to find a stone with a cut that meshes with your ring’s design. The cut speaks to the diamond’s precise shape and the positioning of the stone’s facets. Clarity is another important factor in determining a diamond’s beauty and value. Jewellers use clarity to describe a stone’s physical characteristics or flaws. Before purchasing an engagement ring, you’ll want to decide what kind of ring style suits you best. 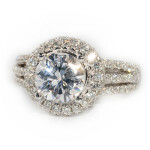 Do you enjoy the look and feel of a modern ring, classic ring, or a vintage engagement ring design? This will be one of the most important factors in designing your custom-made engagement ring. 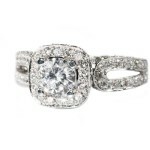 The Internet is an excellent resource when determining what ring design is best for you. We recommend that our clients spend some time on researching, Pinterest tends to be a great source of engagement ring design images. The best engagement ring designs provide the wearer with an emotional connection to their jewellery piece. Get your friends and family to help, share the ring designs that you like online and see what others think. Once you’ve put together a collection of images, look for a common theme, this will help you determine a ring design that works for you. Choosing the perfect setting for your engagement ring will allow you the ability to really showcase the stones in your ring, the setting will also add an extra layer of style to the piece. The solitaire cut is a popular choice for many of our Richmond Hill clients, a time-tested mount that proudly presents a single diamond in a way that demands attention. The halo cut is excellent for engagement rings that contain multiple stones, the centre diamond is surrounded by smaller stones. There’s no mathematical formula for engagement ring shopping, it’s about finding something that speaks to you and symbolizes the journey that you and your partner have taken together and the future that awaits. Take your time and find a ring that speaks to your personal taste and budget. Whether it’s an engagement ring that’s been newly designed, something off the shelf or a family heirloom; it’s your engagement ring and you shouldn’t settle. Our Richmond Hill jewellery store has built a reputation for providing exceptional service, craftsmanship and high-quality. We understand that an engagement ring is a lifelong investment and we work hard to exceed each of our customer’s expectations on every engagement ring we create and sell. Speak to one of our experienced engagement ring designers today and allow us the opportunity to help tell your love story. 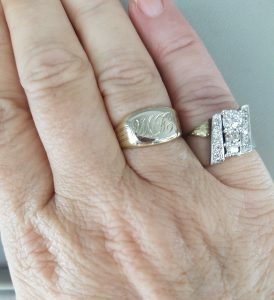 Years ago I lost a treasured diamond ring that was my grandmothers, which I had always wanted to replace. 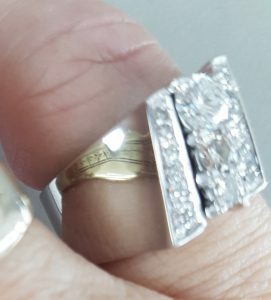 As I have been divorced for several years I had my promise ring, engagement ring and wedding ring sitting idle in a jewellery box for the past 10 years. I decided to go and visit Ed at Odyssey Jewellery in Richmond Hill. I showed Ed my three separate rings which each had a very small diamond in them. I told him the story of wanting to replace the heirloom ring I had lost, but I wanted a more modern look to it. We went through the simple friendly process of me explain my vision. Ed drew up some sketches while I was there at the shop with him and we looked at pictures of different designs and we came up with a concept of the ring I had envisioned. Two weeks later Ed called me and said, “You’re Ring Is Ready, Come On In”. I went right over, very excited to see my new ring! I WAS THRILLED!!! 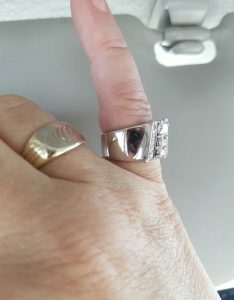 Odyssey Jewellery had taken my rings that were of absolute no use to me into a fabulous new modern ring I now wear every day! An extremely happy customer. I would recommend Odyssey Jewellery to anyone for new Jewellery, Custom Jewellery, Jewellery Repairs or Restoration. I can honestly say they take all your wishes in to consideration and take the time, care and effort to create your masterpiece. A ring is built to last forever, but over time you may develop different jewellery likes and needs. Redsigning or Resetting engagement rings is a great way to hold on to the memories of the past while creating a stunning ring that better matches your current lifestyle and tastes. At our custom Toronto jewellery studio, we’ve worked with many people wanting to reset their engagement ring. Whether they simply want something different, or now have the financial means to have their ring upgraded, we have many exciting options for resetting your engagement ring. Taking a ring you already have in your collection and revamping it can be a more affordable option than purchasing a new ring. Whether it be a few years old, or an heirloom ring that’s been in your family for generations, our experienced Toronto jewellery designers will turn your dreams into reality and we’ll walk you through the entire process. Our goal is to create a unique and personalized redesign for your ring and we’ll find the perfect setting for your stone. More Diamond Accents: Adding accent diamonds to your ring is an excellent way to instantly give your ring a more upgraded look and feel. A common method is to add diamond accents to the sides of the ring. With the right design and stones, you will find your centre stone is highlighted more in the ring’s design with increased focus and shine. Upgrade to a Three Stone Ring: Many of our customers have greater financial flexibility as their career progresses and they want to invest more money in their engagement ring. Upgrading to a three-stone design from a single stone is an excellent way to add more value to your ring and to instantly upgrade its look. We’ll reset your ring to have two medium or smaller stones added, one for each side of your centre stone. This will make your centre stone appear larger in your ring’s design. Diamonds are the most common stone used in a reset, but other valuable gemstones such as rubies or sapphires can be used to create a unique and beautiful ring design. Replace Your Centre Stone: One of the easiest ways to upgrade your engagement ring is to simply replace your centre stone with a larger and upgraded diamond. A larger diamond is a great way to symbolize the growth you’ve experienced in your relationship and also your financial accomplishments. Many couples cannot afford a big stone in the early stages of their relationship and chose to upgrade to a larger diamond as time goes on. 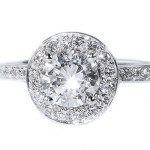 Add a Halo to Your Centre Stone: Adding a halo to your ring is a great way to completely change the overall look and feel of your engagement ring. Our team of ring designers will work with you to find the right halo design that not only frames your centre stone but also adds some more sparkle to it. Upgrade the Setting of Your Diamond: Another way to reset your engagement ring is to upgrade your ring’s setting. 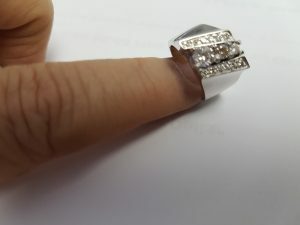 Not only will upgrading your setting make your ring more attractive, it can help protect your centre stone from getting damaged (especially on the sides of the stone). Our team will work with you to find the right setting and bezel for your ring. Add Coloured Stones: Looking for something a little different when resetting your engagement ring? Adding coloured stones to your ring setting can open the door to an almost endless amount of design options. Stones such as rubies, sapphires and emeralds can be used to add an interesting and unique look to your ring. 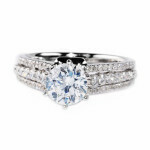 In order to keep your engagement ring look pristine for years to come it’s recommended that you have it maintained by a professional jewellery cleaner on a regular basis. We recommend that our customers have their rings cleaned, inspected and maintained yearly. It’s very important to check the condition of your ring’s stones and the setting claws. 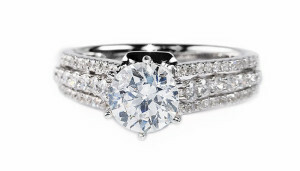 Our team can also do ultrasound cleaning of your ring to keep it sparkling for years and decades to come. 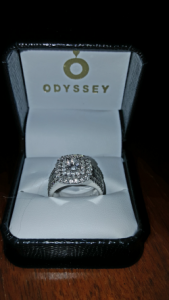 If you’re looking to reset your engagement ring, look no further than Odyssey Jewellery Designers. We’re proud of the high-level of perfection and skill we bring to every engagement ring redesign we do. Our team of experienced ring designers will work with you to come up with a ring reset that suits your tastes and budget. Learn more by contacting us today. Rings are built to last forever, but sometimes taste, budgets, and people change over time. Upgrading or modernizing rings is a very common request from our Richmond Hill and Toronto area customers. There are many reasons why someone may want to upgrade their heirloom ring, wedding band or engagement ring. It can be a case of wanting to have a different setting designed for your stones or perhaps you would like to completely redesign the ring. Many of our customers want to upgrade the quality of their existing diamond and/or add more stones. You may find that your ring needs to be resized? Regardless of the reason, upgrading your ring can be an exciting and affordable process. Upgrading the diamond in your engagement and wedding ring will often mean redesigning the ring’s setting. A bigger stone will usually require a redesigned ring setting to make the ring work structurally and aesthetically. It’s important to protect your diamond by ensuring it’s properly secured to the ring at all times. An experienced jewellery designer will work with you to upgrade your ring setting to design a setting that will protect your stone and showcase its beauty. 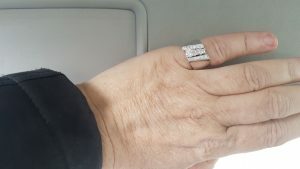 Recently, one of our regular customers came to our Richmond Hill, ON jewellery store to expand her ring. This was the second time JJ came to us to have her wedding and engagement ring modernized. The band of your ring is another common element that may need upgraded over time. Some of our customers find their ring’s current material does not have the durability to suit their current lifestyle, or they simply want a different look. Personal taste can change over the years. Maybe you have a yellow gold ring and now prefer the appearance of white gold. Our team of experienced custom ring designers will work with you to determine if your ring’s current setting will work with your new wedding band. In many cases, we find that you can keep your old setting and simply have it mounted on the ring’s upgraded band material. Over time you may find that your lifestyle requires your engagement ring or wedding band to be made of a more durable material. This need has caused many of our customers to upgrade their ring from gold to platinum. 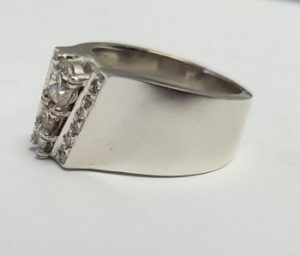 A ring band made of platinum may cost more upfront but will wear at a much slower pace than gold and increase the jewellery piece’s overall value. A well-designed ring is built in a way that all elements of the design work together to create a stunning and elegant look. Modernizing the diamond in your ring can be an exciting, but it can be delicate process. You’ll want to ensure that your new diamond fits into the overall design of your ring. Getting a bigger diamond is a common ring upgrade at our Richmond Hill jewellery factory. Without the right guidance, a bigger stone may compromise the overall look and feel of your ring due to the new stone’s natural colour and clarity not complementing the rest of the ring. There are endless diamond options on the market, and we’ll be your partner to find the right stone for you and your ring. Many of our customers have enjoyed the results they’ve seen after modernizing their ring with a better cut. This is a great way to improve the look of your ring and increase value. A higher-quality cut will instantly improve the appearance of your ring by providing better proportions that offer more light resulting in greater shine and sparkle. Another common upgrade people make to their rings is to add more stones, usually added to the side of the band. You’ll want to ensure the new stones match your current ring design and enhance your centre stone. When a ring is upgraded with the wrong stones it can appear off in appearance and not balanced. When upgrading your ring you may be left with leftover pieces. These materials such as small stones may not be needed in your modernized ring’s new design, but still, they can carry value and personal meaning. Some of these ring materials can be used for future repairs or can be sold for reuse. We’ve seen some of our customers use their ring’s old stones to create a unique and beautiful pendant out of them. There’s a lot to consider when you’re thinking of upgrading your heirloom, engagement or wedding ring and our team of experts will walk you through the entire process. We’ll work with you to design an upgraded ring that will make your existing diamond looking stunning and protect its overall value. Thinking about modernizing your heirloom ring, wedding band or engagement ring? Get started by speaking to one of our experienced Richmond Hill ring designers today. There’s nothing more beautiful than an heirloom jewellery piece. Not only are the rings visually stunning, they carry a resounding and symbolic story with them. Proposing with an heirloom engagement ring is a wonderful and romantic gesture; it allows you the ability to link your love story with generations past. Heirloom engagement and wedding rings can lack a modern touch or the design may not suit the bride-to-be’s taste or style. Sometimes the ring may be gorgeous in appearance, but cannot simply function with the new owner’s lifestyle. At Odyssey Jewellery, we have many design solutions that will blend your unique personal taste with the history intertwined in your heirloom ring. Some people feel obligated not to mess with an heirloom ring’s stone. There can be a sense of guilt when contemplating changing the ring’s setting, the worry of upsetting family members can be a real challenge. That being said, it’s important to have a ring that fits your unique style and taste. We’ve been providing jewellery design services to Richmond Hill and Toronto customers for over 60 years, during this time we’ve witnesses various trends in jewellery design. Our team of experienced jewellery designers will walk you through the process of customizing your heirloom ring. We’ll work with you to create a design that suits your personal tastes while respecting and protecting the history of your ring. An engagement or wedding ring is something that you will be wearing every day and you shouldn’t feel obligated to wear something that you don’t like or that doesn’t reflect your personal style. Resetting your heirloom ring doesn’t mean completely changing the look and feel of the ring. It’s important to have open conversations with the person who gifted you the ring and express your preferences. Including family members in the design process will make for a much easier process and will show your genuine interest in respecting the history of the ring. Be sure to express the reasons why you desire to redesign your heirloom ring. Maybe the current ring in its current setting will not suit your lifestyle, give real-life examples of the potential challenges that you may face. Perhaps the ring is need of repair in its current state and redesigning it now will save future repair expenses and will protect the stone. There’s nothing wrong with stating that despite the ring’s beauty, it simply does not mesh with your own personal style and taste. Highlight the aspects of the heirloom ring that you love and discuss how your new ring design will enhance elements of the original design. Discuss how the ring’s current setting does not suit the size or shape of your fingers or hand. It’s possible that the engagement ring does not match your wedding band. Getting married is something that you’ve probably looked forward to for most of your life, most family members will respect your desire to customize the gifted ring to suit your needs and wants. After discussing your desires with family members you will be ready to begin the reset of your heirloom ring. It’s essential to have your ring inspected and appraised for both insurance and identification purposes. Occasionally an older stone is more prone to being cracked or chipped during the resetting process, an experienced jewellery designer will discuss these potential risks before working on your ring. It’s also possible that once unnoticeable damages can be found during the resetting, these damages or blemishes can often remain hidden with the right bezel setting. After evaluating your heirloom ring we will discuss with you the resetting options and come up with a plan that suits your budget. We will create a sketch of a proposed design, this will give you a great idea of how your ring will look like after the resetting. We’re proud of the reputation we’ve earned for our unparalleled craftsmanship and our high standard of quality. For over 60 years we’ve helped add personality to countless heirloom rings at our Richmond Hill jewellery factory. Our experienced jewellery designers are waiting to walk you through the entire process of resetting your heirloom engagement or wedding ring. 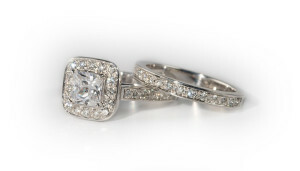 We will make you feel comfortable and excited by giving your ring the care and attention it deserves. Save 25% This Holiday Season! The temperatures are beginning to get colder and the leaves are changing colours. It won’t take long before the holidays arrive and shopping begins. This holiday season give that special someone on your list a piece of custom made jewellery. 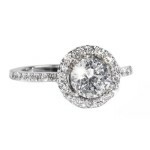 or even engagement rings are a great way to give an everlasting gift! or choose from our beautifully handcrafted custom jewellery. Come see the difference over 60 years of experience and a true passion for quality makes! There’s something special about my rings. They not only express who I am as an individual, they also symbolize some of the most important events in my life. I use my hands a lot for my work and my rings take the brunt of it. 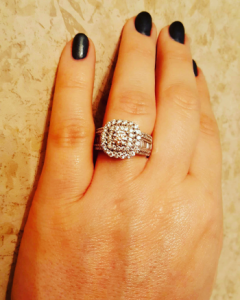 It was approaching the holiday season last year and my husband and I were thinking about purchasing a new ring for a combined anniversary and Christmas gift. We stopped by Odyssey Jewellery Designers Inc, a jewellery shop in Richmond Hill. We had gone there before and enjoyed their selection of custom jewellery. Ed and the staff were always knowledgeable and we always had a positive experience. After taking a look at my engagement, wedding and now anniversary rings, Ed recommended that I redesign the three rings into one unique ring. 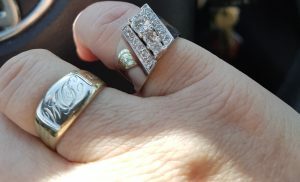 Both my engagement and wedding rings were in need of repairs and we agreed that the original rings looked dated and that their designs had become common. We came to learn that combining rings is a common ring modification. The ring designers solder the rings together to create something symbolic and new. Combining two or more rings into one really opened the door to some really exciting possibilities and it helps protect them against damage. It’s fair to say that I was a little nervous when Ed first suggested the idea of combining my three rings into one. My rings mean a lot to me and it’s an option that I had not considered. Once he explained the process and the possibilities of a fresh and interesting design we became really excited. I was impressed that Ed and the Odyssey Jewellery team took the time to learn about my style, tastes and the meaning behind my rings. At the end of the ring design process, I own a really beautiful and unique ring that I’m proud to wear. Ed used all of my diamonds and added some new ones to create a larger setting that came out really sophisticated and modern. It was love at first site; I absolutely love the final result. The idea of combining rings is becoming more and more popular. It creates an excellent opportunity to create something new and wonderful. We love taking something old and making new again. Having your rings combined is an excellent way to prevent major repairs in the future. 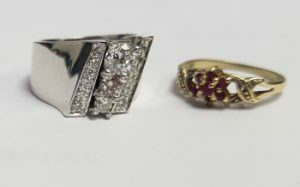 Learn more about how we combine rings and all of our other custom ring design and jewellery repair services by calling us at 905-737-5266, stopping by our 10909 Yonge Street store or by contacting us online here.